Cephalexin is a generic brand medication used to treat infections in the body caused by bacteria; it is part of a group of drugs known as cephalosporin antibiotics. Keflex is a widely used brand name version of this drug. This medication is available by prescription only and as a capsule, tablet, or liquid. It is important to follow the administration directions precisely, as the different medication forms require different methods for taking them. Additionally, be sure to take the all of the prescribe medication; stopping the medication before it is gone can lead to a reoccurrence of the infection. Keflex should be taken exactly as prescribed and should not be taken for longer or shorter periods then directed; it is also important to throw out any unused medication after 14 days. You should always inform all medical professionals that you are taking this drug as it could cause unusual results on some medical tests. Keflex is typically taken every 6-12 hours, individual dosage is based on the condition being treated and on the treatment response. In children the dosage is based on weight. This type of antibiotic is most effective when the amount of medication is kept at constant levels in the body. 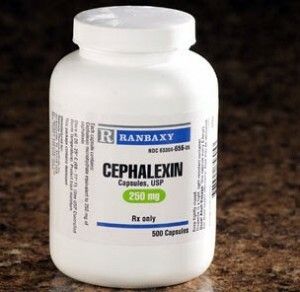 Cephalexin, or Keflex, is an antibiotic that treats infections caused by bacteria; it works by interfering with the cell wall formation of the bacteria which leads to rupture of the wall and a killing of the bacteria. This medication is used to treat infections such as ear infections, skin infections, urinary tract infections, and upper respiratory infections. Cephalexin should not be used to treat viral illnesses such as a cold or flu. You should not use this medication if you have ever had an allergic reaction to cephalexin or similar antibiotics. Vancomycin is a generic medication that is commonly referred to as its brand name, Vancocin. It is a glycopeptide antibiotic, and it is typically only used once treatment with other antibiotics has failed. Levaquin is the brand name for the drug levofloxacin (also known by its alternate brand name, Tavanic), which is a fluoroquinolone antibiotic that works to kill a variety of different bacteria.